Our TYPE of thing. Lol! On a laptop or computer right now? Look down. How cool is your keyboard? Actually, don't answer as we already know the answer: NOT AS COOL AS OURS. That is because lately we've been tap-tap-tapping away on a keyboard with some damn cool retro stylings; one that is both pleasing on the key and on the fingers. We review the Azio Retro Classic Keyboard. What we have here is fairly ordinary product: a USB-wired qwerty keyboard. Although a Bluetooth version is also available in this style, we went for the classic plug-n-play kind for ease of use. 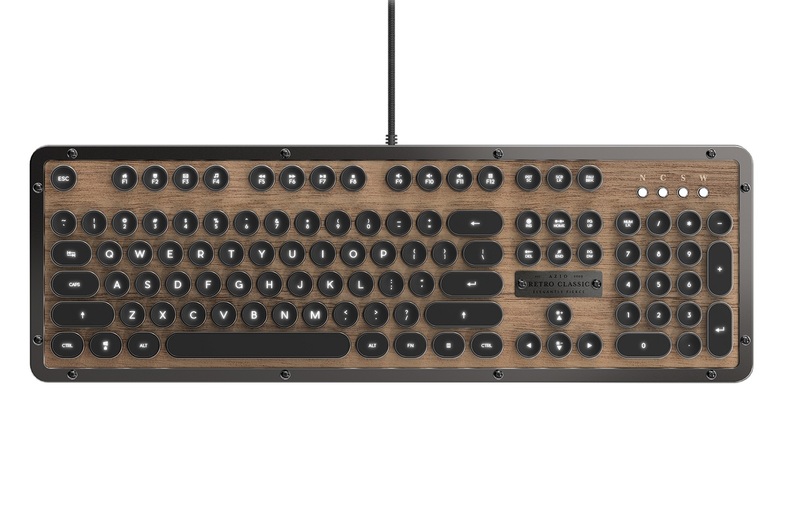 In a nutshell, the Azio Retro Classic is a mechanical keyboard, inspired by a vantage typewriter, with back-lit keys, wooden face, and zinc-alloy frame. In the hand this thing is heavy at 3.5lbs - far heavier that your usual plastic keyboard. But good God, does it feel nice to touch. The zinc frame is solid and smooth, while the wooden face (we got the 'Elwood' type, with leather also an option) is grainy and gorgeous. There are adjustable feet on the underside of that metal body, and a Steampunk-like plague by the keypad. Just look at it. As good as the looks are, if does take a bit of getting used to. The key clicks are loud, and the travel is far, but we've not typed on a more solid and sturdy keyboard before - well, not since the late '90s. The Azio Retro Classic Keyboard certainly isn't a small and portable keyboard, either - it's 45 cm wide. So this is definitely something you'll use only in the home or office. But dam the weight and the size (and the price! ), as the Azio Retro Classic Keyboard is such a wonderful and luxurious thing to behold. 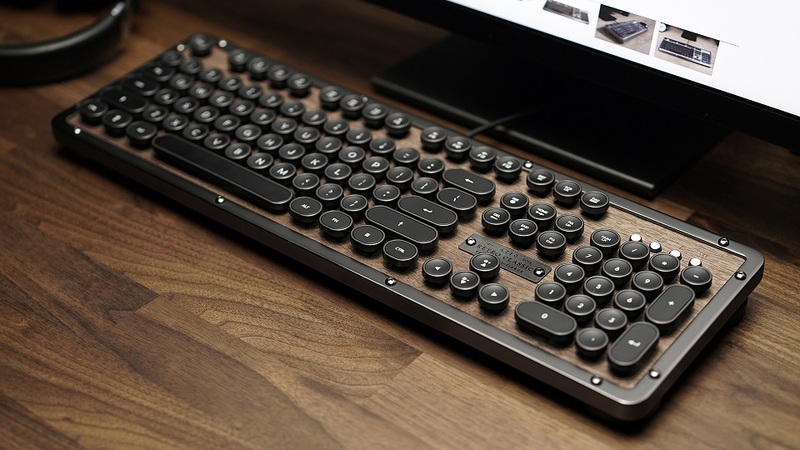 Keyboards are often overlooked when combined with a new desktop computer, or released as a mobile accessory, so it's nice to encounter a company who are focusing on that. 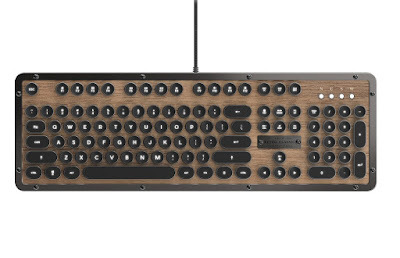 Big, beautiful but expensive, the Azio Retro Classic Keyboard is a luxury item for Steampunk fans, or those who really want to shake things up in the desk department.